The isk keeps flowing into the New Order Treasury. It also keeps flowing out of the Treasury and into the wallets of our gankers, which is kind of the point. 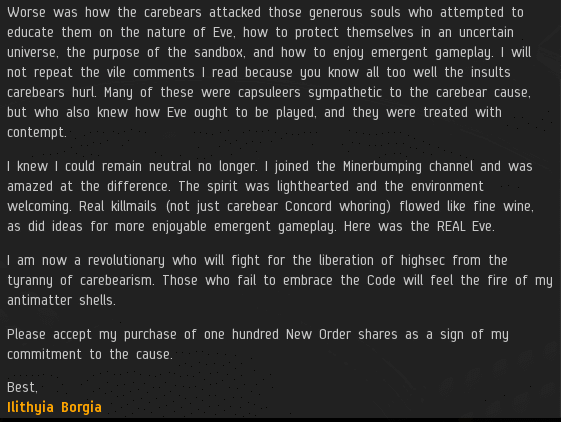 As long as the good people of EVE keep buying shares, our gankers will have plenty of supplies. Tippia, better known as the Queen of EVE-O, purchased 1,000 shares. At last, Tippa earned a Supreme Protector's Tip of the Hat™. She sent us over the 401 billion isk mark. Sasha Nyemtsov, who loves collecting Supreme Protector's Tips of the Hat™, earned another Supreme Protector's Tip of the Hat™ today. His purchase of 1,000 additional shares put us over the 402 billion isk mark. I know you all love behind-the-scenes stuff, so here are a few programming notes regarding the share purchases since the last update. Sasha's purchase of 1,000 shares occurred at the very beginning of September, so you won't see that amount added to the "This Month's Top Supporters" list just yet. The list will be switched over from the August contributors to the September contributors a few days from now. If you want to be on top, you'll at least need to beat Sasha's one billion isk contribution. Ned Thomas bought 20 shares for CCP Falcon. It was a very thoughtful gesture. Players are allowed to buy shares on behalf of other players. Notably, someone purchased 1 share for Chribba (he wasn't thrilled, from what I hear), and someone purchased 315 shares in the name of James 315. Even permabanned characters, such as Erotica 1, have been gifted shares. However, I'm afraid I had to veto Ned's CCP Falcon share purchase. Ever since the notorious CCP t20 debacle, employees of CCP have been required to keep a respectful distance from the in-game power brokers. 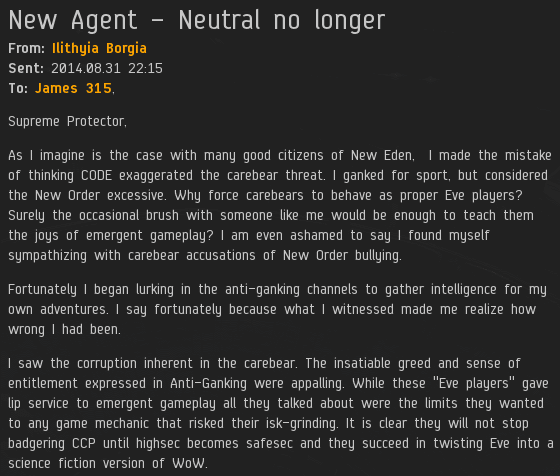 If CCP Falcon or another CCP employee were to gain ownership of New Order shares, it might create a conflict of interest. I would proudly donate, but I'm going to let my subscription lapse, because I've been unable to log in for five days, and CCP is shrugging it off as "third party ISP issues". It's affecting a good deal of the US east coast.